"Toolbox talks are a primary way for construction contractors to provide workers with relevant site-specific safety information," says LHSFNA Management Co-Chairman Noel C. Borck, "but, unfortunately, too many contractors do not understand nor maximize their potential." To help improve safety performance, many employers give toolbox talks on a weekly basis. While reminding workers about various common problems on the site, these instructive, onsite mini-workshops are also used to target specific safety and health concerns that may arise in the course of the coming week's work. However, some employers see toolbox talks as a problem – keeping employees from doing their work – and try to keep them as short as possible. Often, the presentations are canned and from a weekly subscription service and little thought is given to what is said or how it is delivered. Sometimes, workers are required to sign a form to document attendance and ensure a safety discount from the company's insurer. "If toolbox talks are given just to fulfill a requirement and get it over with," says Borck, "it's unlikely they will have much impact at all on jobsite safety and health." What makes a toolbox talk effective? 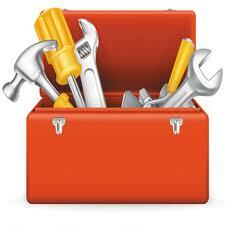 Relevance: To be effective, a toolbox talk must be relevant. Obviously, it does not make any sense to talk about heat stress in the dead of winter, Lyme disease in a region that is not affected or scaffold safety on a highway project. In planning your talks, make sure you choose topics that relate to the site and its sequence of work. Talk with the workers first to see what issues are most relevant at the time. Site-specific: It is best to take a walk through the site first so any topic discussed can be related to real conditions on the job. Interactive: Nobody likes to be lectured, and toolbox talks provide no exception. Talks can be made much more effective by making them interactive with a question and answer format. 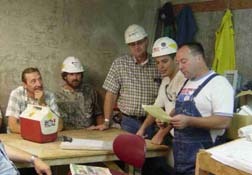 Construction workers bring a lot of experience and knowledge to a safety meeting. By asking for their input, you show respect and make workers full partners in the safety process. Problem Posing: Posing safety problems or concerns and asking for input or solutions will result in a collaborative approach to safety that increases the effectiveness of your program. Whenever possible, ask, “How can we best solve this problem?” By the nature of their jobs, construction workers are required to solve practical problems on the jobsite every day, and safety problems are no different. Enlist your workforce to help you solve safety problems. Storytelling: Most people have a hard time relating to statistics. Often, telling a story has a much bigger impact. Many trainers will comb the local papers for stories of construction fatalities, injuries or accidents or relate stories of problems they have run up against or witnessed (e.g., close calls, friends getting hurt). Telling stories makes the problem a lot more real for people and helps them understand the seriousness of the hazard. Risk Perception: Most people underestimate the risks they take on the job each day. Maybe they are only going to be in that trench or on that scaffold for a minute, and they think nothing could happen. Maybe they have been working unsafely everyday and nothing has happened so they feel invincible. Are there ways you can make the risks more real to workers? For example, flaggers are at risk of being hit by traffic. They may think they will have time to escape if a speeding motorist heads towards them. The Roadway Safety Program has a module that shows exactly how long it takes a driver to stop on dry pavement, wet pavement, a snowy road, etc. On dry pavement, it can take longer than a football field (360 feet) to stop. At night, headlights only shine 160 feet so, by the time a driver sees the danger, it may be too late. These types of examples help dispel myths about how safe the work actually is. Concrete: Like safety posters, toolbox talks are often vague or general, telling workers this or that is dangerous so be careful if you do not want to get hurt. To be more effective, it is better to say exactly what the problem is and describe concrete steps workers and employers can take to reduce the risk of injury. If employees know exactly what to do and have faith it will work, they are more likely to take action. Demonstrations/Hands-On: Construction workers like to see things for themselves or try things out. That is why the “hands-on” portion of training programs is so important. If you can bring in tools or demonstrations for a toolbox talk, they add to its effectiveness. No Victim Blaming: One thing to avoid is blaming the victim. Too often, there is a tendency to identify a problem and blame it on “carelessness.” The solution is simply to “be more careful.” Just as in accident investigation, the closer you get to the root causes of the problem and address them, the more long-lasting the solution will be. "Carelessness" is generally an excuse for not having really thought through the problem and identified what is actually causing it (such as poor supervision or being rushed or short-staffed). Given by Peers: Construction workers are the experts on their jobs. They respect each other and each other’s expertise. Toolbox talks should generally be given by experienced workers. Other workers will pay more attention because they are delivered by people they respect and trust who will not talk down to them. Handouts: Toolbox talks are usually about ten minutes long. You cannot cover everything you want to say in ten minutes, but you can distribute a short handout for workers to read on break or at lunchtime. These handouts can summarize and reiterate the main points and include illustrations. A good handout is short, written in simple, clear language and gives specific action items that a worker can take to prevent injury or illness. A good example is a handout on skin cancer that shows exactly what to look for as early signs of the disease. Setting: Sometimes, the setting can interfere with the message. If you are giving a talk on a bridge site with traffic whizzing by, it may be too noisy for people to hear. One solution may be to get a small speaker and microphone, or, perhaps, the talk could be given in a trailer. Language: Toolbox talks need to be in the language most workers understand and speak. Hispanic workers need toolbox talks in Spanish if that is the language they understand the best. "With a little advance attention and planning, toolbox talks will pay dividends for any construction contractor," says Borck. The LHSFNA publishes more than 70 two-sided, envelope-sized Health Alerts that address most of the on-the-job safety and health and wellness issues faced by Laborers. They are available in both English and Spanish. Perfect as hand-outs for toolbox talks, the Health Alerts can be ordered through the Fund's online Publications Catalogue. The LHSFNA OSH Division would like to post outstanding examples of toolbox talks. If you have one on video, email it to OSH@lhsfna.org for consideration.